The Raptor 90 has the features to deliver more fun than ever before. New from the ground up, the 2010 Yamaha Raptor 90 features an 88cc air-cooled 4-stroke engine with an adjustable RPM limiter and a fully automatic CVT transmission. ” The Raptor 90 has the features to deliver more fun than ever before, with an 88cc SOHC 2-valve engine tuned to develop excellent low-to-mid rpm range performance. 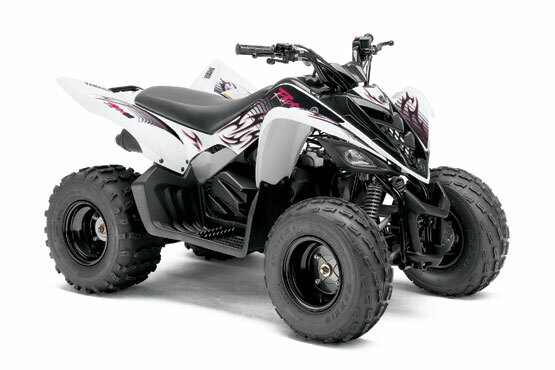 It also has features surprising in this class and price range, like a fully automatic CVT transmission, dual A-arm front suspension, rear disc brake, low-profile tires, and styling unmistakably inspired by the mighty Raptor 700R. 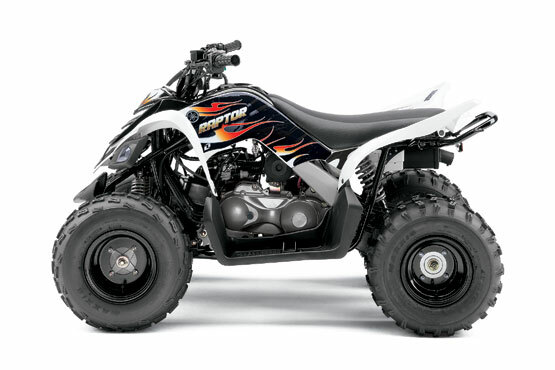 ” Dual A-arm front suspension has 4.4-inches of travel for sporty-riding comfort, while adding to the Raptor 90’s big-ATV look. Shocks have 5-way preload adjustment to accommodate a variety of riders and terrain. The rear swingarm, also 5-way preload adjustable, offers 3.3-inches of travel. ”	For sporty looks and handling, Raptor 90 uses low-profile Maxxis® tires. For riding comfort, there are aggressive-looking full floorboards. ” For strong, reliable stopping power, there’s a hydraulic disc brake with a drilled rotor in the back, and dual sealed drums in the front. ” Restricting power output for learning riders is exceptionally convenient; there’s a simple plug-in for the CDI unit. ” Available in an exclusive White version with two graphics choices young riders will love. ” The go-getter 88cc, 4-stroke, SOHC, 2-valve engine is tuned to develop excellent low-to-mid-range performance, just where it’s needed. Engine is force-air cooled for performance and long engine life, and it uses simple, reliable wet-sump lubrication. ” Easy-to-operate electric starting comes standard, of course, and an emergency kick starter is also provided in a storage spot under the seat for more peace of mind. ” Constantly variable transmission (CVT) means no shifting. Handy for all riders, it’s a feature entry-level riders particularly appreciate. ” Engine power is transferred to the rear wheels via a tried-and-true chain drive. ” Dual A-arm front suspension has 4.4-inches of travel for sporty-riding comfort, while helping to give the front end the look of a big Raptor. 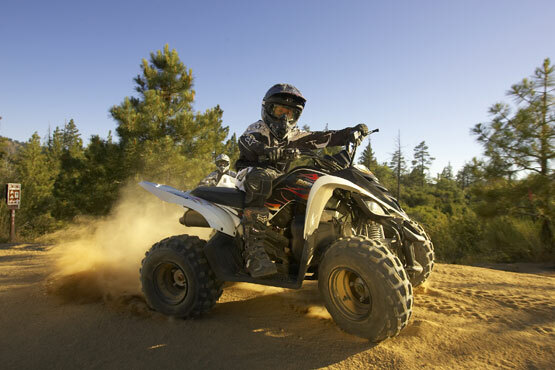 Shocks have 5-way preload adjustment to accommodate a variety of riders and terrain. The rear swingarm, also 5-way preload adjustable, offers 3.3-inches of travel to enhance riding comfort and traction. 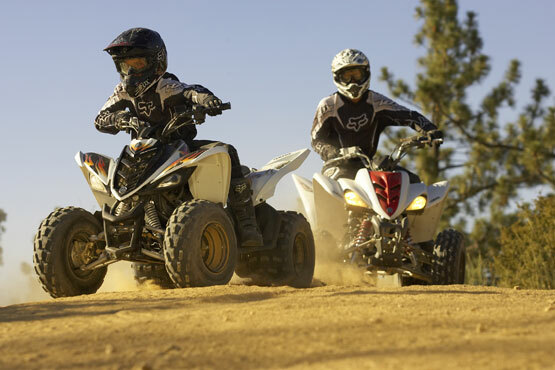 ” Raptor 90 is designed to be comfortable for a wide variety of riders. With its roomy ergonomics, growing riders 12 and older won’t outgrow the machine before they’re ready for more displacement when they’re older. ” Maxxis® low-profile tires, AT18 x 7-8 front and AT18 x 9-8 rear, give Raptor 90 sporty looks and sporty handling. For riding convenience, there are aggressive-looking full floorboards. ” For strong, reliable stopping power, there’s a hydraulic disc brake in the back with a drilled rotor that’s protected against rocks and other obstacles by a beefy guard. Up front, there are dual sealed drums. There’s a handlebar-mounted parking brake, too. ” The DC-CDI digital ignition timing control system means reliable performance, with a strong, efficient spark. ” Battery and other electrical components are conveniently and centrally located for service. Waterproof connectors add to the overall reliability.